Trainer Ed Dunlop, successful six years ago with the brilliant Ouija Board, won a second Investec Oaks this afternoon when Snow Fairy got up to beat Meeznah by a neck and give champion jockey Ryan Moore a first British Classic success. The Intikhab filly, who races for her breeder Cristina Patino, was supplemented at a cost of £20,000 on Saturday for the Investec Oaks after winning a Listed event at Goodwood last month. “I have lost my voice!,” said Dunlop. “Thank you to Mrs Patino for letting us supplement her and I thought that Ryan gave her the most amazing ride. It was a master ride from a master jockey. We got lucky that Ryan was available and we’d won half the battle when we found out he could ride. “Mrs Patino has most of her horses with my father and one with me and one with my brother (Harry), so to win an Investec Oaks is quite amazing. We had doubts about her staying but we knew that she was very tough and that she can quicken, which she showed today. She had the speed unlike a lot of these staying fillies. Although she’s by Intikhab there is a lot of stamina on her dam’s side. “She was not beaten far in the Prestige Stakes last season and then I stupidly thought she was better with give in the ground but she hated the soft going when we ran her at Newbury. “I said to Mrs Patino that she could go for the Oaks or the Ribblesdale and she said that there was only one Oaks. There was no pressure on me because she had won the money needed to supplement her at Goodwood. “It’s an amazing day. I must say thank you to my staff for doing a fantastic job. The whole thing is a bit of a fairytale. 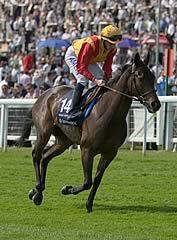 “You can’t compare her with Ouija Board at the moment but she is an Oaks winner. It’s just great to have won two Oaks, especially as this one is from our new yard. Champion jockey Ryan Moore celebrated his first British Classic success when winning the Investec Oaks aboard Snow Fairy. “It was a very rough race with interference early on and I decided to take her back and give her a chance because there was an awful lot of bumping around,” said Moore. “The gaps opened up nicely and, with a good turn of foot, she has quickened up between them. I followed Johnny (Murtagh) through and it all went well. The gap was big enough and I knew she had the speed to take it. It suited her that the pace slackened off in the middle part and allowed her to stay the trip. “I knew that she had speed because she’d won over seven furlongs at two and quickened up very well when she won at Goodwood last time. “She hung on to the fence at the finish and went a bit left but she kept on to win and I’d been confident from two out. Owner Cristina Patino added: “I thought that it wasn’t possible that she could get through and Ryan gave her the most extraordinary ride, the most wonderful ride. “We talked over supplementing her after watching at Goodwood, which I didn’t even know was a trial for the Oaks, and I said yes - the prizemoney was enough so I said put it back in! I give the trainer all the credit because it was a wonderful bit of training. Meeznah went agonisingly close to giving her young trainer David Lanigan a dream result with his first-ever runner in a Classic, losing out to the winner Snow Fairy by just a neck after getting her head in front in the straight in the Investec Oaks. A stone bruise earlier in the season put paid to Meeznah’s chances of runing in a Classic trial, with her her only outing this year being a winning one in a Newmarket maiden, in which she beat the John Gosden-trained Radio Wave by nine lengths. Lanigan, a former assistant to Henry Cecil who is now in his third season with a training licence, added: “I have to say I had a heart attack when John Gosden’s filly got beaten the other day at Chepstow. I suddenly thought, ‘God, I hope I haven’t done the wrong thing’. “I’ve always liked the filly, she’s always had a great mind and showed us plenty at home. A week ago Mr Cecil let me work with a couple of his fillies and I had a lot more confidence after that as she worked well that day. She’s just a very straightforward filly and has lots of class about her. Marcus Tregoning, trainer of Rumoush, felt that his filly had probably not been comfortable on the gradients of the Epsom Down course after she finished fourth in the Investec Oaks. “She’s run a goodish race, but I think she’s got very unbalanced. Possibly she didn’t handle the course, which surprised be a little bit. She stayed all right, the whole family stay well,” he said. Tregoning said that he would wait until he’s spoken to filly’s the owner, Hamdam Al Maktoum, before deciding Rumoosh’s next outing. “The Yorkshire Oaks is a possibility - the track will suit her as long as they get the ground right at York. The track at York for the last couple of meetings has been lacking in grass. It’s been a very hard spring for them and of course they did all that drainage work,” said the trainer. Michael Jarvis, trainer of Sajjhaa who was eased down and finished last of the 15 runners, also felt that his filly was not suited by the course. “She got very unbalanced down the hill and Frankie said her chance had gone before they came round the corner. Obviously, there was no point in giving her a hard race to finish 10th,” he said. Ralph Beckett, trainer of Ceilidh House, was very disappointed with his filly, who was one place in front of Sajjhaa in 14th. “The ground was our only legitimate explanation, but even that doesn’t explain it,” he said.